Fresh asparagus is so good, and even better when its free. Right now its about $2.99 a pound at our local stores – but it’s one of natures most delicious wild (free!) edibles! In late spring in northwest Indiana, I go out and spend time foraging wild asparagus. It generally comes up in late April to early May, depending on how warm the spring has been. Sometimes its difficult to spot asparagus because it can blend in with tall grass, so by the time it’s recognized, its too late to harvest. To combat that problem for those who have never hunted wild asparagus, I recommend looking (in the fall) for mature plants that have gone to seed. You can find pictures of mature asparagus that has gone to seed on the internet or in a plant book. It becomes fairly tall (averaging three feet), almost “fernlike”, and gets a bushy top. As it ages, it goes from green to yellowish or brown. The seeds look similar to dill seed in the beginning, and develop into a round green pod. They look like a pea, and can even turn an orange color. I’ve noticed that asparagus tends to follow telephone lines, fence posts, and fencing. My theory is that birds ingest the seed, sit on the telephone poles and old fencing, and well…just poop it out. The following spring, that’s where its going to grow. If you can spot those plants and remember where they are, then you know where to forage in the spring. Once spring is here, I look for the old plant. By this time, its a beige to off-white scrubby looking piece of brush. However, almost all the weeds look that way, too. I think old asparagus seems to be more like a reed at the base, and to fold over instead of breaking off at the bottom. I sometimes put a marker of some sort for me to recognize a particular spot. This marker won’t mean anything to someone else, but it will to me. I don’t use anything that would cause someone to notice, so it could be a big rock or a nail head sticking out of an old fence post. Use your imagination. When wild asparagus first comes up, it will be within a foot or so of the original plant. I gently turn over old grass and brush, and look underneath for the new growth. Many times, it looks purple or mostly purple with a little green. As it grows taller, it looks all green. Its tall, slender, and has triangular patches along its stalk. It gets pointy at the top, and has a head of seeds. I pick it when it is around 6 inches or so. This stuff grows FAST. When the county trucks come around and mow along the edges of the roads, the asparagus grows faster than the grass, so it really stands out shortly after mowing. In fact, the more you cut it down, the more it wants to grow! As it matures, it develops “branching”. It still can be harvested, but it starts getting tougher toward the bottom. I take only the more tender upper part, or cut away the tougher portion at home. Once it looks like a tree, I just let it go to seed. I have taken home with me branches with seed that are ready to drop to “seed” my own property. 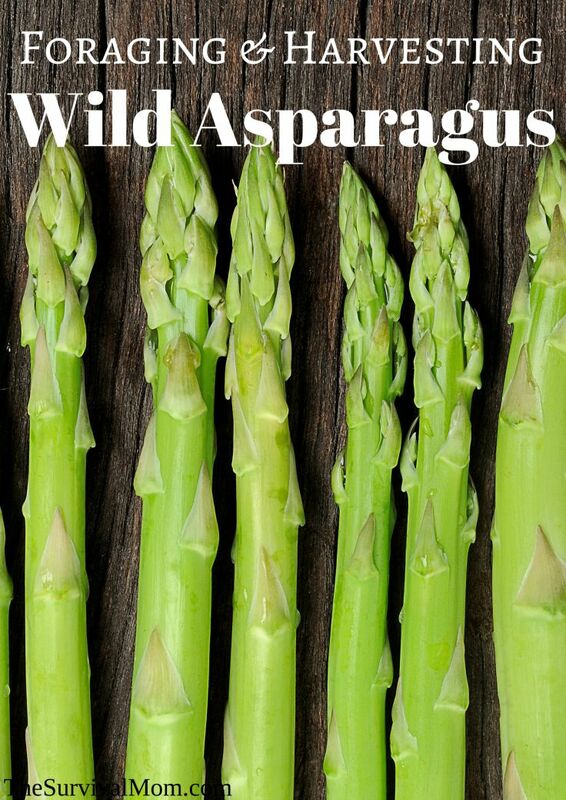 If you don’t want to do this, many farm stores and garden centers sell asparagus root to plant in your garden. The drawback is that it takes about three years to get the asparagus big enough in diameter to harvest. I’ve also had my husband rototill right over the roots and kill them. To prepare the spears, I clean them with fresh water, pat dry, then take a large bowl and toss them with a little EVOO (Extra Virgin Olive Oil) and whatever spices I want to add. I like seasoned salt, garlic powder, or even Lemon-Pepper. Then I put foil down on the preheated grill and let them cook. I think a little char on them is quite tasty. Sometimes, I make pasta, and add my grilled asparagus pieces along with other fresh vegetables and a chicken breast, and voila…a healthy and scrumptious dinner. If I want to freeze it, there are two methods. You can blanch it to stop the enzymes from degrading the spears, and retaining the color and texture. After blanching, place it in ice water to stop the cooking. Pat dry. and place in freezer bags. You can also vacuum seal the asparagus (which I do), then you can eliminate the blanching. I’ve done both and prefer the vacuum sealing because ice crystals still manage to form in the freezer bags. I know someone out there is going to ask the question, “Why does my pee smell bad after eating asparagus?” It’s because digestion breaks it down into sulfurous amino acids. So, no, you are not getting a UTI, it’s just the small price you have to pay for enjoying this spring delicacy! 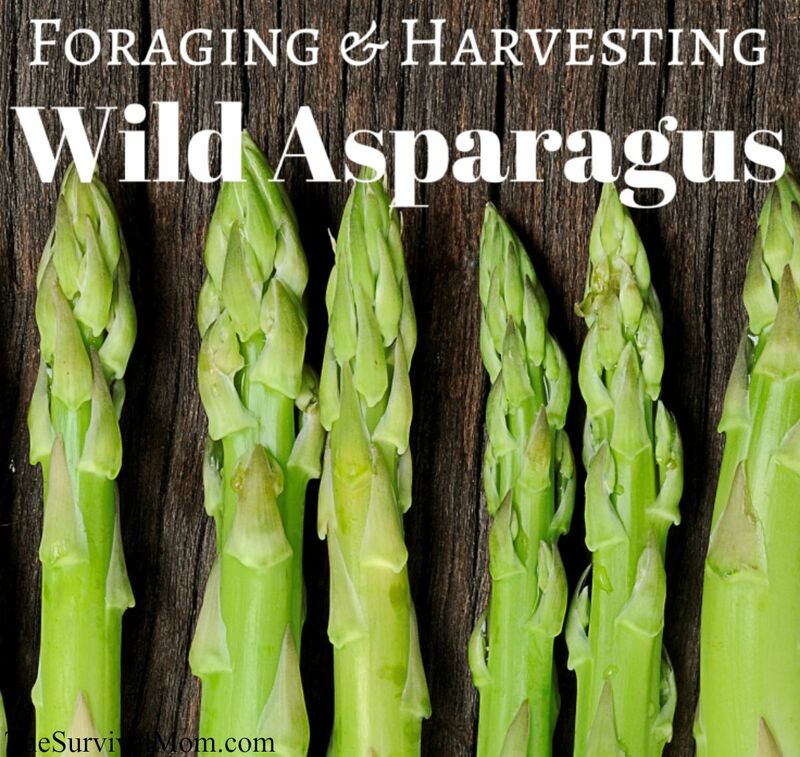 Foraging wild asparagus is just one more survival skill to add to your collection! Want to learn more about foraging? Check out these recommended resources! It’s so good & cheaper than store bought. I like to add my foraged Sheepshead mushrooms to it & sautéed them. Then I throw it into pasta or just have it as a stand alone dish.